Poland’s new conservative euro-sceptic government has removed the European Union flag from its weekly press conference for Prime Minister Beata Szydlo, in a symbolic gesture that underscores the new regime’s cooler relations with Brussels, and its more patriotic outlook. 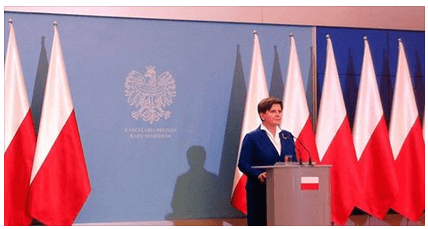 “We have adopted the principle that the statements made after the meeting of the Polish cabinet will be implemented against the background of the most beautiful, white-and-red flags,” Ms Szydlo, who was sworn in as prime minister last week, said in response to a question asking where the EU flags, which had previously featured alongside Polish flags, had disappeared to. Ms Szydlo’s right-wing, socially-conservative Law and Justice party won a sweeping majority — the first in modern Polish history — last month, reports Henry Foy in Warsaw. Since the election, the party has said it will not honour an EU scheme to share refugees, and voiced concern over the EU’s climate change policies. This entry was posted in News & Views on November 25, 2015 by RomanInUkraine.